This year's TITANS OF METAL ISRAEL, brought to you by Progstage Productions, has been scheduled for December 17th at Hanger 11 in Tel Aviv, Israel. 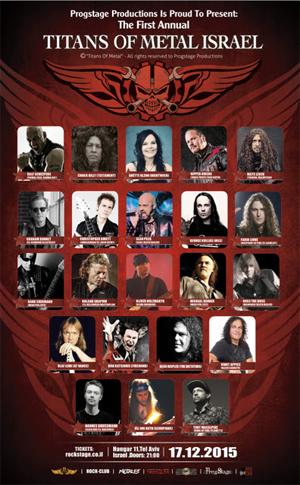 This year's roster of artists scheduled to appear include: Chuck Billy (Testament), Sean Peck (Cage, Death Dealer), Anette Olzon (ex-Nightwish), Ralf Scheepers (Primal Fear, ex-Gamma Ray), Tim "Ripper" Owens (ex-Judas Priest, Iced Earth), Mats Levén (Candlemass, ex-Therion, Yngwie Malmsteen), Christopher Amott (Armageddon, ex-Arch Enemy), Hannes Grossmann (Alkaloid, ex-Obscura), Uli Jon Roth (ex-Scorpions), Hank Shermann (Mercyful Fate), Michael Denner (Mercyful Fate), Oliver Holzwarth (ex-Blind Guardian), Bob Katsionis (Firewind), Olaf Lenk (At Vance), George Kollias (Nile), Dean Rispler (The Dictators), Vinny Appice (Dio, Black Sabbath), Roland Grapow (Masterplan, ex-Helloween), Ross The Boss (Death Dealer, ex-Manowar), Tony Macalpine, Graham Bonnet (ex-Rainbow), Fabio Lione (Rhapsody Of Fire, Angra). Further details and tickets go HERE.